Old Masters auctions in recent years have not been very stellar, but this season Sotheby's has accumulated a wealth of fine works and has divided it into two catalogues, Arts of the Renaissance, which is the morning sale, and Old Masters, which is the afternoon sale the same day at 2 PM. The sale sold only 61.37 percent of its 140 offered lots for a total of $32,320,475. The somewhat disappointing and uneven results reflected perhaps the recent downturn in the NASDAQ market, and perhaps some quibbles over attributions. Nevertheless, many works did quite well, indicating that the market is still strong for high quality and rare works. The impressive catalogue for the first sale is quite stylish with details of four lots on the cover and several introductory essays to different parts of the sale with reproductions of works not in the sale. There are a great many museum-quality works, especially those of the Italian Renaissance, indeed there are enough works of high quality to start a nice, small, but choice museum. Among the stand-outs are works by Giovanni di Paolo, Carlo Crivelli, Pseudo Piero della Francesca, Veronese, and the Master of the Legend of St. Catherine. Many of the best and most intriguing works are by artists whose names are relatively unknown except to connoisseurs. Lot 1, for example, "Christ Blessing a Pinnacle," by Luca di Tommè (circa 1330-1389), a 15 3/4-by-10 3/4-inch gold ground, tempera on panel with additions to adapt it to an arched top, shown above. Di Tommè, the catalogue noted, was "one of the principal painters in Siena in the mid-trecento, and helped to establish the characteristics of that school which had been formulated by Duccio and the Lorenzetti." "The present panel," it continued, "a work of the artist's mature period, is the central pinnacle to a polyptych of the Madonna and Child with Saint Anne flaned by Saints Catherine of Alexandria, John the Baptist, Anthony Abbot and Agnes, which is signed and dated 1367 (Pinacoteca Nazionale, Siena)." The polyptych was in the Capuchin convent of San Quirico in Osenna from 1567 to at least 1867 and in the Pinocoteca Nazionale, Siena, by 1872. "The present panel, however, was already in the collection of the distinguished connoisseur and artist Jean Anton Ramboux…by 1862," the catalogue's entry stated, "where it formed the central image in a made-up altarpiece…As with much of his collection, the Christ Blessing found its way into the Wallraf-Richartz, Cologne, and was deaccessioned by that institution in 1925." The next year it was at the Ehrlich Galleries in New York and it was acquired by its present owner at Christie's, May 31, 1991. Bernard Berenson considered the work to be by Niccolo di Segna. A simple but very strong work, the head of Christ and his right hand are very nicely painted and the bold inscription on the open manuscript is quite startling. The work has a conservative estimate of $70,000 to $100,000. It sold for $137,750 including the buyer's premium as do all results mentioned in this article. Lot 3, "Saint Francis Receiving the Stigmata and Saint Catherine of Siena," a 16 3/8-by-12 1/2-inch gold ground, tempera on panel with an engaged framed, by Giovanni del Biondo (active circa 1356-1398, shown above, is another very fine trecento work. The panel has a coat-of-arms, which has not been identified and is very nice and charming and has a conservative estimate of $50,000 to $70,000. It sold for $46,750. Lot 7, "Madonna and Child," a 30 1/4-by-18 3/4-inch gold ground, tempera on panel with an arched top, by Don Silvestro di Gheraducci (1339-1399) is another trecento work that is simple, but in very nice condition. "The artist was a monk of the Camaldolese order at the monastery of Santa Maria degli Angeli, Florence, where the scriptorium (or workshop devoted to the illumination of manuscripts) boasted a number of other highly significant artists, including the young Lorenzo Monaco. Don Silvestro himself became prior of the monastery in 1398, and would have guided the younger painter's activity soon after his arrival in 1391 until his departure to set up an independent studio a few years later. In addition to his very important work as an illuminator of manuscripts, Don Silvestro painted a number of panel pictures, such as the present example. In fact, his work as a painter of easel works was little understood until recently. Offner grouped a number of works around a Madonna of Humility in Florence, thereby christening the artist as the anonymous 'Master of the Orcagnesque Humility' (however, a breakthrough article by Levi d'Ancona in 1957 correctly identified many of the works so named as by Don Silvestro). His style shows (as noted) the influence of Orcagna and Jacopodi Cione, but the inventive and robust qualities of the minuraturist style are also evident in his work, and he can be considered one of the most original and significant artists of the 14th Century Florence." The panel was at one time in the collection of Wildenstein & Co., in London. It has an estimate of $300,000 to $500,000, which reflects its considerable charm in the handling of the figures' faces and hands and the Child's ornate shirt. It sold for $533,750. Lot 14, "Madonna and Child Enthroned with Angels," 58 by 28 1/2 inches, that is "Attributed to Giovanni Domenico Botticini"
Lot 14, "Madonna and Child Enthroned with Angels," is a particularly handsome work, 58 by 28 1/2 inches, that is "Attributed to Giovanni Domenico Botticini (15th Century)." The work was formerly in the collection of the Fine Arts Gallery of San Diego where it was attributed to Zenobi Machiavelli). It has a conservative estimate of $80,000 to $100,000 as it is a nice composition. It sold for $81,250. The Child holds a golden boy and is standing on the lap of the Madonna who has a crown held above her halo by two angels while two other angels are in the foreground, one with head turned towards the front. There are two works by Pseudo Pier Francesco Fiorentino (active second half of the 15th Century, Lots 20 and 24. The former, shown above, is a very fine "Madonna and Child with the Young Saint John the Baptist with God The Father Above," a 40 1/8-by-20 1/2-inch oil on panel with arched top. The faces in this picture have considerable character and the field has flowers in the foreground and a bird and a deer in the background. A bird rests on the left knee of the Child and the Young Saint John the Baptist is holding a staff in front of the Madonna. The lot has an conservative estimate of $140,000 to $180,000. It failed to sell. Lot 24, shown above, is a nativity scene tondo oil on panel, 26 inches in diameter. It has an estimate of $50,000 to $70,000, but is a bit more primitive than Lot 20 with rather unusually but sharply delineated ruins. It sold for $58,250. One of the highlights of the auction is Lot 21, "Scenes from the Story of Esther," a 20 3/4-by-71 1/8-inch tempera on panel from a cassone, shown above, by Giovanni di Paolo (1403-1483). Di Paolo is one of the finest Sienese artists and this panel is a fine example of his early style and is in very good condition. It has a conservative estimate of $800,000 to $1,200,000. It sold for $885,750. Lot 25, cassone panel by Apollonio di Giovanni (1415-7/1465), 16 1/2 by 50 1/2 inches, "The Continence of Scipio." Lot 25, shown above and in detail at the top of this article, is a smaller but more spectacular cassone panel by Apollonio di Giovanni (1415-7/1465). It measures 16 1/2 by 50 1/2 inches and depicts "The Continence of Scipio." About sixty paintings survive from Apollonio's workshop in Florence and Ellen Callmann believes that only about a tenth of those are by Apollonio. This has a very conservative estimate of $150,000 to $200,000 as Apollonio di Giovanni and his workshop were leading producers of these marriage chests that were often made in pairs and this is particularly ornate and charm with a great many details. It sold for $302,750. Carol Crivelli (circa 1430-5-circa 1495) is one of the great minor Renaissance masters who had a partiucularly striking style of rich details and patterns and strong outlines. "While his highly unique and eccentric vision has some affinities with artists such as Mantegna and his followers, Crivelli is a relatively isolated artistic figure; he and his family plied their trade in relative quiet in the Marchigian town of Ascoli Piceno, remote from surrounding artistic trends," the catalogue remarks about Lot 26, "Saint Lawrence," a 22 1/2-by-15-inch tempera on panel with silver leaf, showna above, by Carlo Crivelli and Studio. The catalogue notes that Bernard Berenson had published the picture as a work of Carlo's brother, Vittore, "part of a larger polyptych of two registers in the collection of Brinsley Marlay, London," but that F. Zeri felt that the work was by Carlo "with studio assistance" and that the present work was part of a polyptych for the Church of San Lorenzo in Castello (Castel San Pietro), dateable to 1486-8. The catalogue further notes that the panel "appears to have originally been full length and has been reduced at sometime before its modern history," adding that "According to Zeri, other parts of the triptych are to be found in the Ashmolean (Saint John the Baptist, half length); National Museum, Tokyo (a Bishop Saint, full length); and the Museum Catharijneconvent, Utrecht (Saint Augustine, half length)." The panel was formerly in the collection of Brinsley-Marlay, london and Thyssen-Bornemisza collection, Castagnola (Lugano), before 1986. It is strange that several parts of the triptych cited by Zeri are half-length, but in any event this panel is remarkably full of depth and is very bold in its use of silver leaf against a blue background. The hands are unmistakably done by Carlo Crivelli but the saint's right eye has a rather unusual shape. In any event, it is a very striking work and has a very conservative estimate of $80,000 to $120,000. It sold for $69,750. Lot 27, shown above, is a 12-sided salver, 24 1/2 inches in diameter, tempera on panel, that the catalogue states is by the Master of Sant'Ivo (active at the end of the 14th and beginning of the 15th Century). The top side depicts "The Garden of Love" and the underside depicts flowers. Such salvers were often given to a couple on the occasion of the birth of their first child much as cassones were given at marriage. The catalogue notes that this lot is "among the more elaborately and elegantly composed examples of the genre, of which only about forty or so have survived" and "is remarkable for its excellent state of preservation and for tis relatively early date of circa 1400-1410," a dating based on stylistic grounds. Quaint and charming, it has an very ambitious estimate of $600,000 to $800,000, especially when compared with Lot 25, mentioned above. It sold for $445,750. Lot 28, shown above, is an 8 3/4-by-6 1/4-inch oil on panel, arched at the top, of "Saint Luke Drawing a Portrait of the Virgin," that the catalogue states is by the the Master of the Legend of the Magdalene (active circa 1490-1526). It is a fine, bold work with a dotted gold background. "The artist takes his name from an altarpiece depicting the Legend of Saint Mary Magdalen now dispersed and divided between the museums of Budapest, Copenhagen, Schwerin and the John G. Johnson Collection, Philadelphia. A sixth panel, formerly in Berlin, Kaiser-Friedrich Museum, was destroyed in 1945. Friedlander speculated that the Master might be Pieter van Coninxloo, who was active in Brussels at the court of Philip the Fair between 1481 and 1513. The composition of the present panel is based upon Roger van der Weyden's panel of St. Luke drawing a Portrait of the Virgin, now in the collection of the Museum of Fine Arts, Boston….Recent examination with infrared reflectography has brought to light that the underdrawing shows the image of the Virgin on his drawing pad." The lot has a very conservative estimate of $60,000 to $80,000. It failed to sell. A particularly striking painting is Lot 36, "Abraham and Melchisedek," shown above, a 47 1/4-by-19 3/4-inch oil on panel by the Master of the Antwerp Crucifixion (active first half of the 16th Century). The catalogue states that this is part of a set of eight panels that formed the double shutters for a now dismantled altarpiece, whose central panel probably depicted the Last Supper and has not been traced. The very tall panel has very tall figures, many in armor with a reclining dog in the foreground and a dramatic landscape in the background. It has a style of elongation and considerable elegance and is very impressive, especially for those with a fondness for Don Quixote. It has a very conservative estimate of $40,000 to $60,000. It sold for $35,250. Lot 37, "The Virgin and Child in an Extensive Landscape," a 19 1/8-by-13 3/8-inch oil on panel with an arched top that the catalogue describes as "School of Antwerp, circa 1540." An especially lovely work is Lot 37, "The Virgin and Child in an Extensive Landscape," shown above, a 19 1/8-by-13 3/8-inch oil on panel with an arched top that the catalogue describes as "School of Antwerp, circa 1540." The figures are finely painted and the background is a very bold composition divided by a stand of trees with mountains, castles and water in the background and broken fences in the foreground corners. Its estimate of conservative $70,000 to $100,000 reflects its museum quality. It sold for $110,000. Lot 38 is a very fine "Virgin and Child" by Bernard van Orley (active 1515-died 1541-2), a 23 1/2-by-18 1/2-inch oil on panel, shown above. The work is in excellent condition and its lively composition well captures the artist's rather muscular and monumental style. It has an estimate of $400,000 to $600,000. It failed to sell. A good companion piece to Lot 38 is Lot 42, a very bold "Holy Trinity," shown above, that the catalogue describes as "Flemish School, early 16th Century." The 16 3/4-by-12 1/2-inch oil on panel was once attributed to Albrecht Durer when it was in the well-known collection of Johann Peter Weyer in 1852. In 1898, the catalogue continued, "it was published in the catalogue of the collection of King Carol I, Romania, as attributed to George Pencz. Hans Gmelin, in his 1966 article on the oeuvre of George Pencz, rejected the attribution to George Pencz and suggested that this work might be by the hand of Jan Gossaert. There are six other known versions of this composition, all on panel, that hang I the collections of the Hessiches Museum, Darmstadt; Musée Magnin, Dijon; villa Vizcaya Museum, Miami Beach; Rochuskapelle Nurnberg and in a private collection in Paris. The present panel is the most beauiful and in the best condition of all seven….Ebert Schifferer…argued that all six versions are based on a lost composition by the early German master Hans Baldung Grien, although this has subsequently been questioned by scholars who feel that stylistically these works do not relate to Baldung Grien but are far more reminiscent of the oeuvre of Jan Gossaert during his period in Middelberg. It was most recently published as Jan Gossaert and studio by Peter van den Brink in the 1996 exhibition Lust und Verlust." The key to the attribution is the angel on the right, who very much looks Baldung Grienesque and the face of Christ, which is moustachioed and bearded and quite unlike most other representations. The central part of the composition is particularly dynamic with God's hand over the crossed arms of the dead Christ and the painting's coloration is very saturated. There is an immediacy and intimacy to the composition that is very powerful and whether the painter was Grien or Gossaert or someone else, the estimate is very conservative at only $60,000 to $80,000. It sold for $75,500. Another painting that presents unresolved attribution problems is Lot 44A, "The Virgin and Child" that the catalogue states is by the Master of the Bentinck-Thyssen Madonna (active early 16th Century). This 37 1/4-by-25 1/4-inch oil on panel with an arched top is very appealing, especially the Child, which is done in a style consistent with the very high quality of the Master of the Female Half-Lengths. The Madonna's face, however, especially the highlights on her forehead and her mouth and her hair, are somewhat inconsistent with the Master of the Female Half-Lengths. The painting was at one time attributed by Friedlander to Adriaen Isenbrandt (active 1490-1551), but the catalogue's attribution is "due to Dirk de Vos of the Groeningemuseum in Bruges, who will publish the present painting in a forthcoming article upon the question of the problematic relationship between the schools of Bruges and Antwerp in the first half of the sixteenth century, with particular regard to the artistic personalities of Gerard David, Adriaen Isenbrandt and the so-called Master of the Female Half-Lengths." "In de Vos's opinion," the catalogue continued, "the Bentinck-Thyssen Virgin and Child is the finest of a group of around eighteen works, whose stylistic traits suggest a hand trained in the workshop of Gerard David in Bruges, but probably later active in Antwerp. The design of the present painting is also to be found in two further panels, both attributed by Friendlander to Isenbrandt, but with marked differences in the facial types; the first was formerly on the art market in The Hague, and the second is now in the collection of the Marques de Camporeal, Spain….As Friedlander observed, the present work also reflects a possible awareness of the work of Ambrosius Benson, who was to become Isenbrandt's principal competitor in Bruges after 1520. In 1957, Georges Marlier grouped five paintings previously attributed by Friedlander to Isenbradt or Ambrosius Benson around a Nativity at Hampton Court which is signed in monogram GB under the name of Ambrosius Benson's eldest son, Guillaume….In 1983, John Wilson added the present picture to that group in his doctoral dissertation….The attribution of the present work to Guillaume Benson was followed in the landmark exhibition of painting in Bruges which took place in that city in 1998, and for which this picture was chosen…where it was exhibited along with the Hampton Court painting. Current scholarly consensus, however, takes a more conservative view, since the close stylistic links between this work and the signed Hampton Court picture, the only secure work by Guillaume Benson, do not warrant a firm attribution to that little-understood artist." The lot has an estimate of $200,000 to $300,000, which reflects the rarity of such works in such good condition and the painting's quality. There is a touch of Gerard David in the Child's face, and perhaps this authorship will not go much further than workshop of Gerard David, but that is not a terrible thing. It failed to sell. Lot 49, a portable triptych, 7 1/8-by-16-inches, gold ground and oil on panel with a central panel depicting the Crucifixion, the left panel depicting four angels with the reverse depicting the mandyllion (or impression of Christ on a hankerchief, the right panel depicting Saint Jerome and its reverse the Virgin Galaktotrophousa, "Attributed to Nicholas Tzafouris (15th Century)"
Lot 49, shown above, is a portable triptych, 7 1/8-by-16-inches, gold ground and oil on panel with a central panel depicting the Crucifixion, the left panel depicting four angels with the reverse depicting the mandyllion (or impression of Christ on a hankerchief, the right panel depicting Saint Jerome and its reverse the Virgin Galaktotrophousa, which the catalogue states is "Attributed to Nicholas Tzafouris (15th Century)." Tzafouris was a painter from Crete who combined Byzantine and Italian styles. This very nice little triptych has an estimate of $75,000 to $100,000. It sold for $87,000. Perhaps the loveliest work in the auction is Lot 50, "Madonna and Child," by Bernardino di Betto da Perugia, called Pinturicchio (circa 1425-1513), a very fine example of this excellent and rare artist's work. The octagonal, gold ground, tempera on panel measures 16 1/2 by 15 1/4 inches and has a conservative estimate of $300,000 to $500,000 since his works are about as rare and as desirable as those of Signorelli and Carpaccio. It sold for $335,750. "Although subsequently obscured by the more famous names of the High Renaissance and Vasari's negative assessment of his work, Pinturicchio (so-called because of his small stature), was one of the leading painters in Umbria during the second half of the 15th Century. Trained in the artistic style of his native Perugia )it is unclear who his master was, but it seems to have been either Bartolomeo Caporali or Fiorenzo di Lorenzo), he was of sufficient standing by 1481-82 to collaborate with the most famous artist of his home-town, Perugino, on the frescoed walls in the Sistine Chapel in Rome. His lively and lyrical style was admired by the Roman elite (Vasari noted in his Vite that Pinturicchio's style was particularly pleasing to 'princes and lords'), and he received a number of important commisions as well as gaining a fine reputation as a painter. He became a favorite painter of the Spanish Pope Alexander VII, and was commissioned to decorate his living quarters, the so-called Appartamenti Borgia in 1492. Despite his lengthy sojourn in Rome, Pinturicchio maintained links with his native Perugia, returning there throughout his life, and also travelled to Siena where he remained for the last ten years of his life, working for the illustrious Piccolomini family (most famously on the frescoes in the Picolomini Librrary in the Duoma at Siena)." The Child is holding a goldfinch in its right hand and the elaborate goldleaf background and elaborate punchwork and intertwining motif is, according to the catalogue's entry, "somewhat retardataire and suggests the that the patron commissioning the panel may have particularly asked for this as opposed to a more modern landscape setting. Lot 55, "The Madonna and Child, a Landscape Through a Window Beyond," by Alessandro di Mariano Filipepi, called Sandro Botticelli (1441-1510), shown above, is a 30-by-19 1/2-inch panel in quite good condition. It has an estimate of $700,000 to $900,000, which is quite conservative for such a fabled artist, but perhaps reflects the fact that the Madonna's face is not as graceful as customary with Botticelli, and that the overlapping of the halos is a bit awkward and that the Child's arms are quite strange in their proportions and that his right thigh is a bit too prominent. It sold for $940,750. The catalogue notes that "the figural composition of the Madonna and Child relates to other examples, with significant differences, most notable among these is a full length Madonna and Child in the Galleria Colonna, Rome, ascribed to his workshop….The present work had been considered a studio production until a recent cleaning has revealed its autograph status." It was, in fact, sold at Sotheby's in New York January 18, 1986 as "Studio of Botticelli." A more satisfying work is Lot 69, "The Symbols of the Four Evangelists," by Paolo Caliari, called Veronese (1528-1588), an oil on canvas, 32 5/8 by 53 7/8 inches. This work is very conservatively estimately at $300,000 to $500,000 as it comes from Palazzo Pisani, San Stefano, Venice, the Prince of Lichtensten collection, Burg Lebenstein, and the Contini-Bonacossi collection in Florence. It sold for $445,750. The catalogue suggests that it was painted in the mid-1570s or 80s and notes that the lion represents St. Mark, the angel, St. Matthew, the eagle St. John and the bull St. Luke. Lot 82 is a collection of 24 Augsburg turned wood and pastigilia draughtsmen with portraits of princes and commoners, circa 1540, that is property of the Franz Koenigs Collection and has a modest estimate of $15,000 to $20,000. It sold for $159,750. These 1 15/16-inch diameter portraits are lovely bas reliefs and similar sets are in the Basel Museum, the Kunsthistoriches Museum in Vienna, the Bayerisches Nationalmuseum in Munich, the Fuggermuseum in Babbenhausen and the Victoria and Albert Museum in London. Lot 83 is a very nice small "Portrait of a Man" by Corneille de Lyon (1510-1572), a 7 1/2-by-6 1/2-inch oil on panel. It has an estimate of $40,000 to $60,000. It failed to sell. Lot 87 is two wings of an altarpiece, "The Annunciation of the Virgin, with Saint Bartholomew and Saint Peter," by the Master of the Holy Kinship, circa 1490, each wing measuring 53 by 74 inches and mounted together in a frame. The very impressive work has a conservative estimate of $300,000 to $500,000. It failed to sell. The catalogue notes that the present work formed the outside wings of a triptych that hung in the parish church of Saint Martinus, Aachen-Richterich. The middle panel, depicting the Crucifixion, is in the Musée Royaux des Beaux-Arts de Belgique in Brussels. The inner wings, representing the "Adoration of the Magi" and the "Resurrection of Christ," were separated from the outer wings at a 1978 sale at Christie's in London, and are now in the Indiana University Art Museum in Bloomington, Indiana. Hans Hoffmann (circa 1530-1591-2) was a leading painter of Nuremberg who was commissioned by Emperor Rudolf II of Prague to paint Lot 91, "A Hare in a Forest,' a 62-by-78-inch oil on panel, that is based on Albrecht Durer's "A Study of a Hare" and "Large Piece of Turf," both in the Albertina in Vienna. Hoffmann added botanical elements, some exotic, such as the African marigold, and his painting contrasts sharply with Durer's painting of a hare because his animal is placed in a natural habitat whereas Durer's was isolated. The picture later became the property of Queen Christina of Sweden when her country conquered Prague in 1648. The top of the painting has warped backwards considerable. It has an estimate of $1,000,000 to $1,500,000. It sold for $2,645,750 to the J. Paul Getty Museum. Christopher Apostle, senior vice president and director of Sotheby's Old Master Paintings Department, said after the sale that "we are thrilled that the Hoffmann painting was purchased by such a distinguished institution. This is a very unique work, the only known painting by the artist, and commissioned by Emperor Rudolph II Hapsburg, King of Hungary and Bohemia in 1585." Lot 78, a "Portrait of Giovanni Angelo Dannona, half length, holding gloves and a letter," by (Giovanni) Ambrogio Figino (1548-1608) sold for $1,435,750, way over its high estimate of $180,000. This afternoon sale, which has the same sale number of the "Arts of the Renaissance" catalogue, has a broad range of paintings. Among the highlights are an El Greco, a Jan Brueghel the Younger, a Claude Lorrain, a Sir Joshua Reynolds, a Salomon van Ruysdael, a David Teniers, among big names, and William Drost, Michael Garnier and of and Lorenzo Lippi, among lesser-known names. Lot 195A, "The Penitent Magdalene," shown above, by Domenikos Theotokopoulis, called El Greco (circa 1541-1614), is an oil on canvas that measures 34 by 26 1/2 inches. It has a modest estimate of $600,000 to $800,000 and the catalogue notes that Dr. Alfonso Pérez Sanchez has examined it and verbally stated that he believes it to be by the hand of El Greco, "although somewhat compromised by old restorations." It failed to sell. The catalogue also notes that this composition relates directly to Titian's "Magdalene in the Hermitage in St. Petersburg. 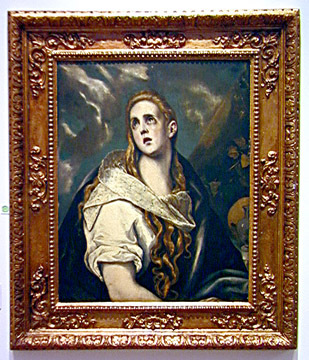 There are a number of El Greco versions of this subject. El Greco first treated the theme circa 1576-9 in a work in the Worcester (Mass.) Art Museum," and another is in the Nelson Atkins Museum. Lot 132, "Allegory of Abundance," is a delightfully busy and lively oil on panel, 29 1/2 by 46 1/4 inches, by Jan Brueghel the Younger (1601-1678) and Hendrik van Balen (1575-1632). The catalogue notes that this work relates in composition to another collaboration by the two artists that is in the Glasgow Art Gallery. This lot has an estimate of $500,000 to $800,000. It failed to sell. Lot 136, "Pastoral River Landscape with Figures by a Mill," by Claude Gelée, called Claude Lorrain, is a 29 1/2-by-39 1/4-inch oil on canvas. The painting has an estimate of $1,000,000 to $1,500,000. It sold for $2,095,750 to a private European collector. Lot 154, "The Child Baptist in the Wilderness," shown above, by Sir Joshua Reynolds (1723-1792) is one of several versions the artist executed of the same subject. The dramatic and impressive 50-by-40-inch oil on canvas has a conservative estimate of $600,000 to $800,000. It failed to sell. Other versions are in the Wallace Collection in London, the Minneapolis Institute of Art and a private collection. The catalogue quotes a biographer of the artist as noting that the artist often painted different versions of the same composition. Lot 164, "An Estuary with a Wijdschip and other Smallcraft," by Salomon van Ruysdael (circa 1600/03-1670), is an unusual vertical picture by this Dutch master. The 14 1/2-by-12 3.4-inch oil on canvas is a pleasant seascape and has a slightly ambitious estimate of $1,000,000 to $1,500,000. It sold for $1,105,750 to a dealer. Lot 110, "Dulle Griet (Mad Meg)," is a very nice oil on canvas, 17 1/4 by 26 inches, by David Teniers the Younger (1610-1690). It depicts, according to the catalogue, "the personification of the sin of avarice in Netherlandish folklore, [and] is here represented as a woman brandishing a sword and carrying a basket of loot. Her greed is so great she is not afraid to storm hell itself, fighting off demons, to get her spoils." The lot has a conservative estimate of $80,000 to $120,000. It failed to sell. Lot 104, shown above, is another, more conventional work by Teniers, entitled "Man Holding A Pipe and Glass of Beer." The very nice oil on panel measures 6 3/8 by 5 3/8 inches and has a conservative estimate of $15,000 to $20,000. It sold for $46,750. Lot 118, "Self Portrait of the Artist," is a very fine oil on panel, 11 1/4 by 9 3/4 inches, by Willem Drost (circa 1630-after 1680). Drost was an important member of Rembrandt's workshop and this work clearly shows the influence of his teacher. It has an estimate of $300,000 to $500,000. It failed to sell. Lot 218, "A Fashionably Dressed Young Woman in the Arcade of the Palais Royal, Paris," by Michael Garnier (active circa 1785-1819), is the cover illustration of the catalogue for this part of the sale. It is signed and dated 1787 and is an oil on canvas, 17 3/4 by 14 1/2 inches. It has an ambitious estimate of $400,000 to $600,000 that reflects the fact that it is a stunning and beautiful and arresting picture. It sold for $621,750. Lot 175 is a ravishing "Group Portrait of Vittoria della Rovere and Companions with the Tribune of Santissima Annunziata, Florence, in the Background," by Lorenzo Lippi (1606-1665), a 50 3/4-by-47 3/8-inch oil on canvas. Vittoria della Rovere was the daughter of Claudia de Medici and Federico della Rovere, Duke of Urbino. "Although her claim to the Duchy of Urbino was largely set aside…[in 1624], when Francisco Maria della Roverre agreed a pact with Rome stipulating Urbino's incorporation into the Holy State of the church, she was immediately seen as the bride for her cousin Ferdinando II de'Medici and was officially betrothed to him in 1613 when she was barely two years old and he thirteen." The painting was once in the Guicciardini collection in Florence. It is startling it is bold and bright colors and has an appropriate estimate of $600,000 to $800,000. It sold for $720,750 to a London dealer.